Sometimes we forget what a blessing it is to be able to turn on a faucet and have fresh, clean, cool water gush out. Many are not so fortunate. I am most often reminded of this on my trips into rural areas of Southern Africa. A 25-liter container and a several-kilometer walk to the nearest muddy stream provide enough water to keep a household alive for another day. This thought inspired a recent well-digging project in Zambezia, one of the northern provinces in Mozambique. 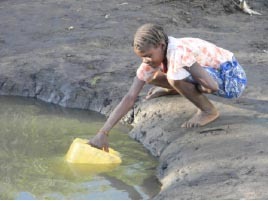 Grace Communion International has about 80 congregations in Mozambique, all of them rural, and none of the villages where the churches are located have easy access to fresh water. 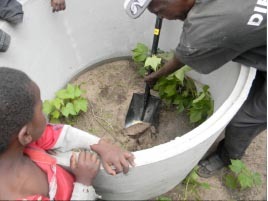 Several generous congregations in Canada offered to finance digging wells in the hope of improving the quality of life of our brothers and sisters in Mozambique. Accompanied by two friends and trailers loaded with concrete pipes, we headed for Morrumbala, a small village north of the mighty Zambezi river. We travelled for four days and slept uncomfortably alongside the road or in the front seats of the vans, but the incredible welcome we received when we finally arrived, accompanied by much singing and dancing in true African style, made it all worthwhile. We collapsed exhausted into our tents. Early the next morning, we three intrepid first-time well-diggers arose, hoping beyond hope that our project would be successful and we would be able to assist the village by providing them with easily accessible fresh water for the first time in their lives. Two sites were chosen: one in the village where Pastor Mariano Binzi (GCI National Leader) lives, and the other on the GCI church property, which is on a crossroads. A well there, where the roads meet, would benefit many local people. Teams of diggers were assembled, the pipes unloaded, and digging began, with the local chief removing the first spade-full of earth. Fortunately, the ground was soft and sandy and progress was rapid at first, with the diggers driven by the excitement of the project. As we dug deeper, we used buckets to haul up the soil being removed, and additional rings were positioned to protect the workers and the well from cave-in. The diggers worked all day and well into the night, always hopeful and on the lookout for any sign of water. Early the next morning a cheer arose as the first well hit water. A few hours later we were doubly rewarded with water in the second well back in the village, just about five meters below the surface. We departed three days after arriving, with one well completed and the second just requiring another half-meter of deepening to increase the water supply. I knew that life in the village would never be the same again. I couldn’t help but think of the analogy that Christ used: he is the source of living water, and that those who thirst should come and drink of his eternal waters and never thirst again. The Holy Spirit, the gift that Christ offered to the Samaritan woman at Jacob’s well, is compared to a fountain of water (John 4:10). He imparts growth and gives life. Without a relationship with God, which is made possible through Christ’s sacrifice and the indwelling of the Holy Spirit, we remain spiritually dead and lifeless, living in much the same state as so many in Mozambique do. They had survived from day to day, unaware that the amazing gift of water was right there with them, but they just could not see it. Next time you turn on your faucet, think of those who are less fortunate than you and who don’t enjoy free access to an endless stream of living water! You will probably never have the chance to dig a well for somebody who needs life-giving water, but there are many who thirst spiritually and don’t realize that Christ is near and they need never thirst. Why don’t you offer to show them the well of life, where they can drink freely and never thirst again? This dirty mud-hole was where the villagers in Fraqueza, Morrumbala, had been drawing water for washing and drinking. 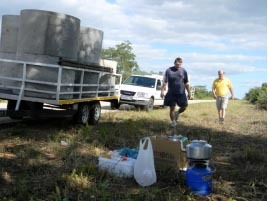 Mike Rabe and Dawie Maree taking a lunch break on the long trip from Johannesburg, South Africa, to the Zambezia province in Mozambique. The local chief starts the well-digging process by removing the first spade full of soil. 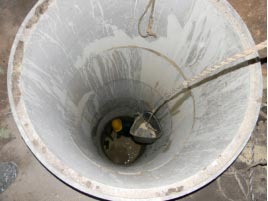 Working within the cramped confines of the well, the soil is removed bucket by bucket, until finally water is struck. 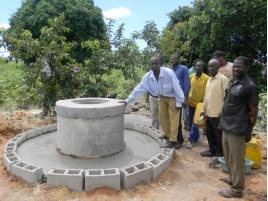 The first well, finished and capped, admired by Pastor Mariano and other villagers. Our 87 congregations in Mozambique are very poor, and communication in rural areas is difficult. 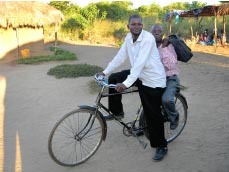 A basic bicycle, costing less than $100, makes a big difference to the effectiveness of the pastors serving their people. GCI’s congregation in Indianapolis is partnering with Tim Maguire to provide bicycles. They hope to eventually provide bicycles for each of the pastors serving our 87 churches in Mozambique.